Nine clubs shared in the latest round of the Sports Grants Funding Program announced by CMOC-Northparkes Mine and Parkes Shire Council totalling $22,226. The successful applicants were: Parkes & District Amateur Soccer Association $1,494; Parkes Dragon Boat Club $3,400; Police & Citizens Youth Clubs NSW Ltd $2,145; Parkes Hockey Association Inc $4,500; Parkes Railway Bowling Club $3,135; Parkes Public School $917; Parkes AFL Club $2,000; Parkes Spacemen Rugby League Football Club $1,635 and Parkes Rugby Union Football Club $3,000. Parkes Sports Council Chairperson, Alan Gersbach said it would be great to see more clubs put forward their projects to compete for the grant funding which promotes sport development and participation. The joint funding agreement between CMOC Northparkes Mine and Parkes Shire Council will distribute $170,000 in sports related funding over three years. The next round, which opens in June, will see a total of almost $57,000 available for sports related projects within the Parkes Shire. The Parkes Dragon Boat Club welcomed Member for Orange, Phil Donato MP to Lake Endeavour for the first time last Friday. He came with good news announcing the club had received two grants. “I am pleased to announce funding of $6,500 under the 2018 Community Building Partnership Program, and a further $1,640 under the 2018 Local Sport Grant Program,” Phil said. The larger grant will go towards two dragon boat trailers, and the second one will be used for the training and accreditation for the coaches. “It’s wonderful to see our dragon boating community continue to thrive, and it’s an honour to be able to support them in their endeavours. Sport is a vital part of our regional living that unites us all,” said Phil. The Bogan Gate Golf Club celebrated on Tuesday after its successful application for funding through the 2018 Community Building Partnership Program. The club with the assistance of Member for Orange, Phil Donato, received $7,000 to be utilised for a kitchen and bathroom refurbishment to enhance the facilities of the venue that plays a very important part in the social life of the small community. “This is the last remaining sporting venue in the community and our volunteers work very hard to keep it going,” she said. Chris Cox, Di Howell, Lorraine Baker; Chris Curteis, Kate Keogh, Maureen Baillee def Eileen Bradley, Hilda McPherson, Rhona Went. Winners for the day were Carol, Rosemary and Jan, runners-up Eileen, Hilda and Rhona, and ‘60’ club winners Eileen, Valmai, Jan and Merilyn. Thanks to Lea Orr for the birthday cake to celebrate March birthdays. In the CWD Singles played at Cowra this week Kim Evans got through to the second round, while Maree Grant and Liz Byrne were only defeated on their final ends with the scores being level. Thanks to our players and markers from our club who helped make a great day. The final of the Club Championship Singles will be played on 19th March between Cherie Frame and Maree Grant. The Club Championship Pairs close 12pm on 19th March. Pennants games commence on Thursday, 21st March against Forbes. The Pennant teams are Gwenda Carty, Kim Evans, Brenda Davies, Liz Byrne and Jan McPhee, Lorraine Baker, Robyn Morgan, Rhona Went. Good luck to our players. The Trading Table will be held next week so please bring items for the table. The raffle prize will be a voucher for a Thai massage. To play social bowls please ring table selectors Maureen Miller and Audrey Jones between 8:30am and 9am. Social Heather Harvey. 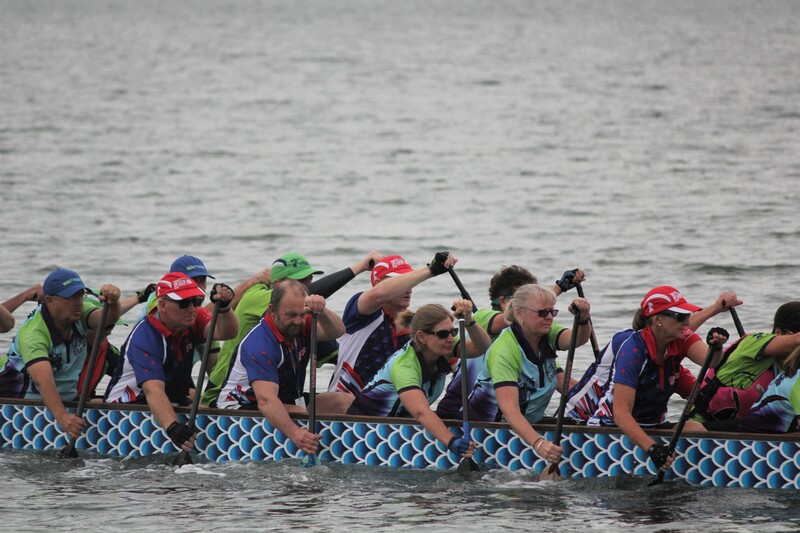 The Shellharbour Regatta on the South Coast was another first for 11 members of the Parkes Dragon Boat Club (PDBC) last weekend. The day of racing on Lake Illawarra started early morning with nine sports teams and 11 community teams competing. Parkes combined with Forbes, Wagga Wagga and one Mudgee member to form two Waratahs teams for a great day of fun and friendship, with one of the combined teams qualifying for the finals. Paddling on salt water was also a first for many members. “It was so much fun to be in a boat with all of our friends from Forbes, the Wagga crew and Lynette from Mudgee,” said President of PDBC, Bill Thomas. The next event for PDBC will be a campout at Dunn’s Swamp with other western region teams, followed by the participation of five PDBC members at the Nationals. Linda Snyman, Donna and Warren Edwards, Rochelle Smith and Maggi Barnard will be racing with elite athletes from all over Australia in Canberra over Easter. If you’re interested in having a go at dragon boating call Bill or Beth on 0418253045 or Warren on 0417240230. Three Gold For Ian ‘Thorpedo’ Kaupke! Record numbers attended the 2019 edition of the Central West All Abilities Swimming Carnival at the Parkes Aquatic Centre last Wednesday with 120 nominations across 24 races. Teams from Temora, Cowra, Orange, Dubbo, Bathurst and further afield attended the blue chip event. They were not disappointed with some outstanding individual and team performances. For Parkes’ Currajong Disability Services Jamie Cook, Thomas Davis, Kyal Sauer and Tim Wheeler all performed admirably with ribbons for first, second and third in numerous events. It was an outstanding effort, however the day again belonged to Ian Kaupke winning three gold medals. Only 12 months before he also scooped a bagful of medals. “The passion he shows for all the things he attempts is also admirable,” said Neil. While Kaupke was one of many who performed well on the day, it was LiveBetter from Orange who stole the major gong. In their first attempt, LiveBetter dominated many of the events including the female races and relays. “LiveBetter were very worthy winners and we are extremely happy they have participated in our carnival,” said organiser Indigo Kriedemann of Currajong. “All the teams from all the providers should be pleased with their efforts. Without them, days like this can’t be a success and we are thankful for their sportsmanship and support,” she said. The first round of the Club Championship singles was played this week with Maree Grant defeating Pat Cooney in an exceptional game of bowls with the score 25 – 24. In other games played Liz Byrne defeated Brenda Davies, Lorraine Baker defeated Robyn Morgan, Rhona Went defeated Jan McPhee and Gwenda Carty defeated Kim Evans while Elaine Miller won on a forfeit from Maureen Miller. The draw for the next round to be played on or before 26th February is: Liz Byrne v Gwenda Carty, Cherie Frame v Lorraine Baker, Merilyn Rodgers v Elaine Miller, Maree Grant v Rhona Went. In a game of social pairs Carol Reid and Frances Charlton defeated Chris Curteis and Di Howell. The scroungers game saw Isabel Svendsen, Di Greenhalgh and Christine Cox enjoying good bowls. for social Margaret Hawken. All visitors and new members always welcome. The netball winter competition is starting on Tuesday, 5th March. Get a team together or just register online through MyNetball and you will be allocated into a team. The competition will run for 14 weeks with finals to follow. The cost for adults has been discounted to $155. Parkes and District Netball Association is registered with Active Kids which means juniors can play for free, otherwise the cost is $100. All registrations will be done online through MyNetball and payments via direct deposit to Parkes Netball. Registration closes on Friday, 22nd February. Sign up at www.mynetball.com.auto.